Is there a room in your home that frustrates you? An area in your house that totally stresses you out? A space that just doesn’t work for you and your family? For us, this was the mudroom. It was absolutely dreadful. There wasn’t a good place anything – bags, coats, shoes, or packages that came in the mail all haphazardly piled up. We had a old bench awkwardly blocking the light from the window. The room itself was pretty boring – the beige walls, the brownish tan floor, and an outdated light fixture. 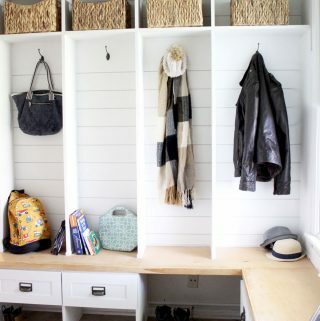 Tired of sighing every time I walked in the house or did laundry, I decided to make some simple changes to the mudroom. 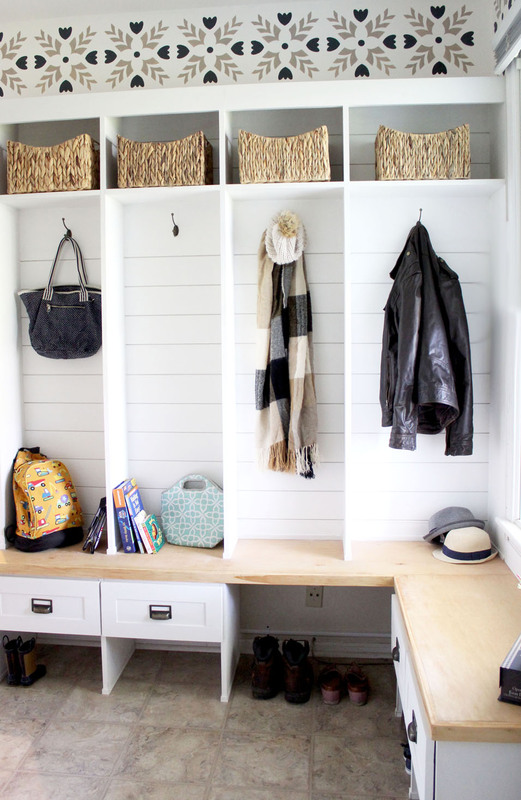 Here are 10 photos from our mudroom makeover that are totally awesome and will hopefully inspire you to transform a space in your home that drives you nuts. Let’s start with the before photos. Now, I just have to say that these before photos are real life. This is exactly what the room looked like day in and day out. You can see why it drove me so crazy. First, we cleared out the room, relocated the wooden bench and started fresh. We decided to do an accent wall – that was half stenciled and half shiplap. It turned out so awesome, right?! The stencils are from Stencil Revolution, and we have a stenciling tutorial coming soon! We also built a DIY bench (see above and below). This was a simple place for people to sit to take their shoes off. 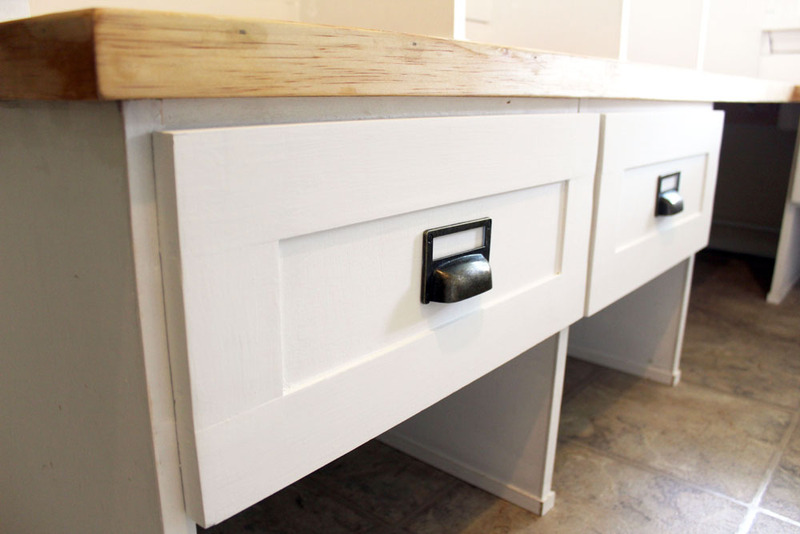 Additionally, we put drawers underneath for winter accessories. 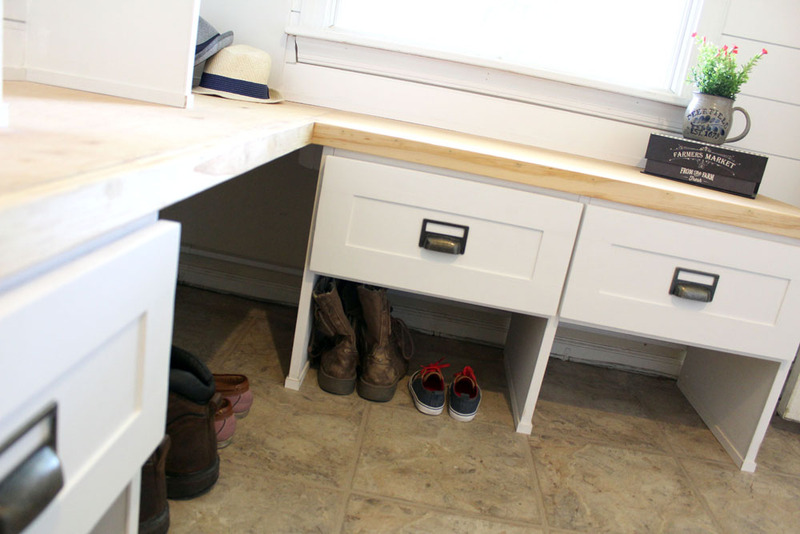 Underneath the drawers was open space for shoes. A tutorial and plans for this DIY bench are coming soon! As you can see, the bench allowed much more light to come through the window. Above the bench, we also built locker-style cubbies. 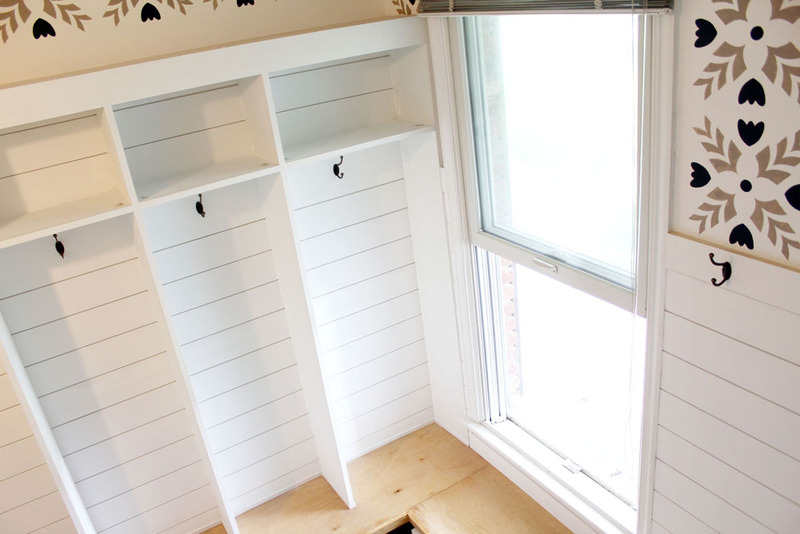 Within these cubbies, we installed more shiplap to create a uniform look across the room. Then, we stenciled the wall above the entryway piece. It’s amazing the difference that a gorgeous light fixture makes. This was the view walking in. What a difference! And, it was so much more functional for our family because there are tons of places to put everything. The drawers the huge, the hooks are plentiful, and the baskets help with extra storage. 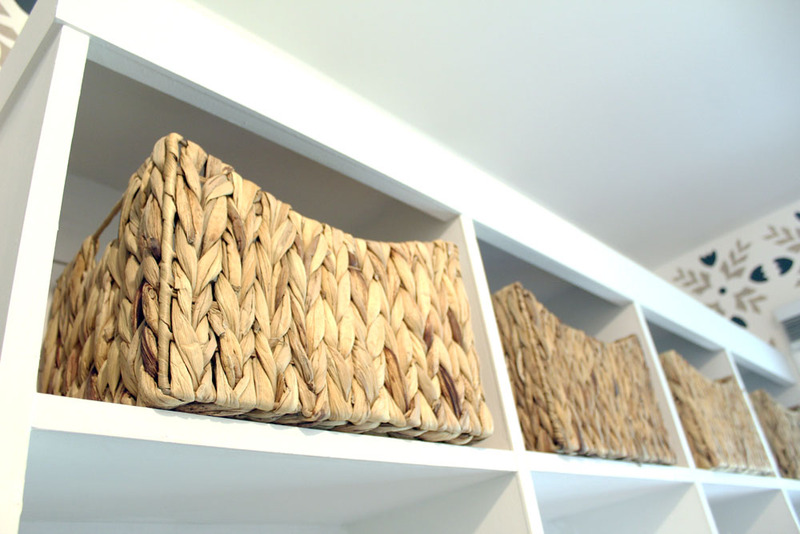 You could also make your own storage bins with cardboard and contact paper – thrifty and easy! 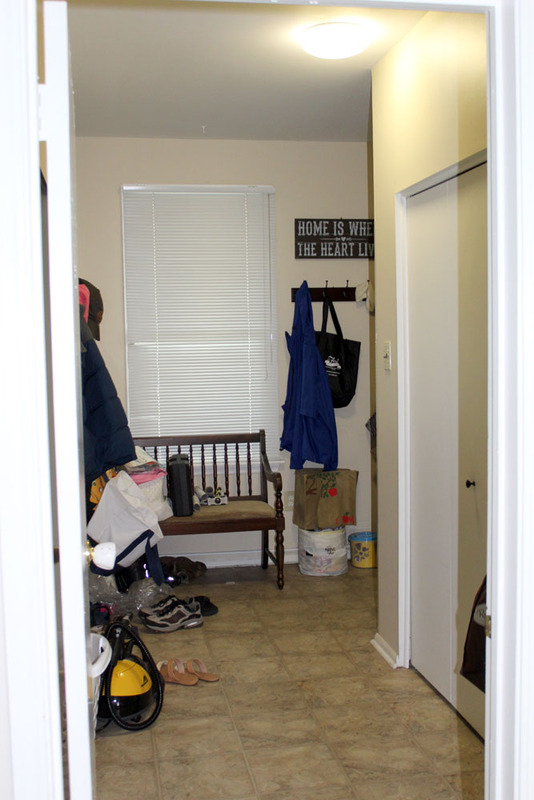 And, comparing the mudroom to the before picture, here is the same view as the before picture. SUCH a difference, right!? 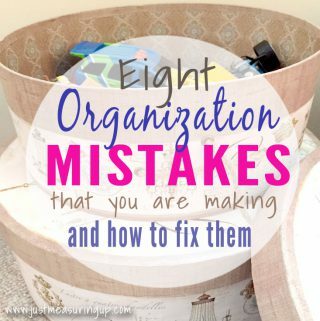 It’s absolutely amazing to walk into the room and not see a disorganized mess. Everything has a place in the entryway cubby shelves. The locker-style cubbies help to keep everyone in the family’s things organized. The L-shaped bench provides plenty of seating for our family and visitors to put their bags or sit and take off their shoes. 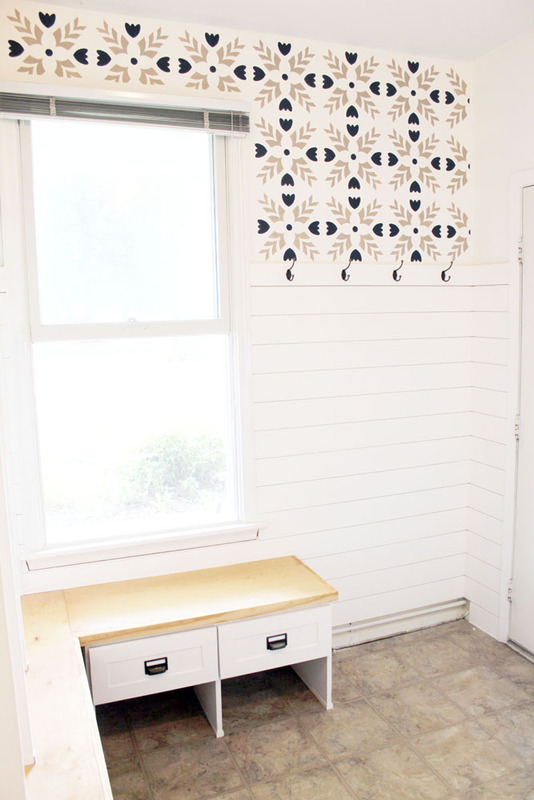 The stencil and shiplap add so much character to the room. It definitely looks like a completely different space. Have a room that you want to makeover? If you are wondering if you can do this, you CAN! 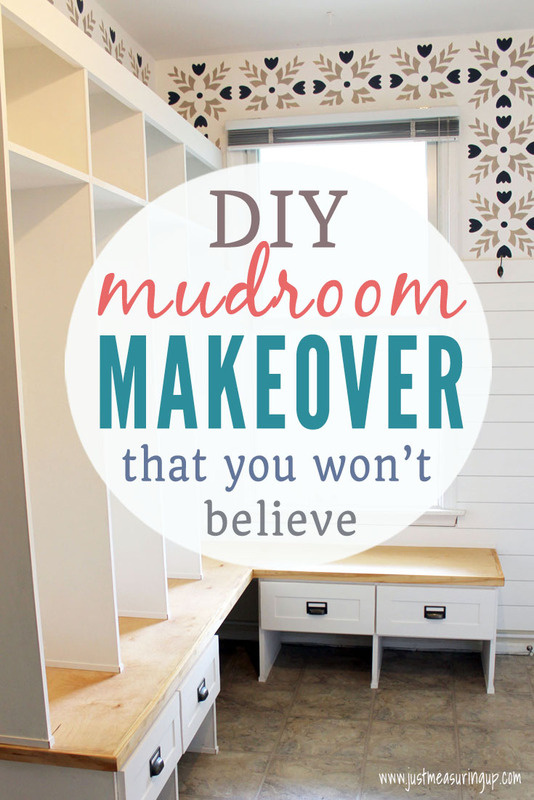 You can totally makeover a room into something you love too! If you have a room in your home that’s driving you crazy, stressing you out, adding to your frustration, then definitely sign up for our FREE challenge 33 Days To a Space You’ll Love. We will send you daily emails with simple assignments which will help you transform a room in your home in a month’s time. 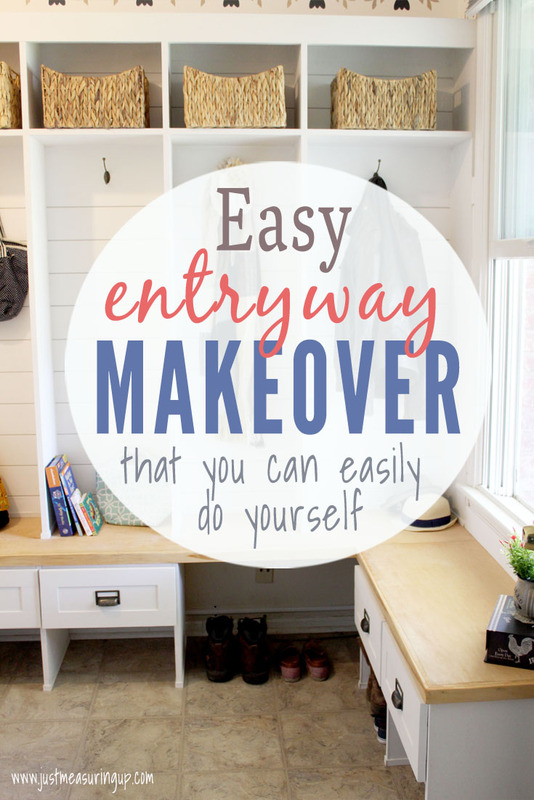 You don’t need to have a lot of time or money to makeover your room – just a willingness to make some small changes. Small changes in a room make a HUGE difference. Make sure to sign up for our FREE guide and you will be transforming a space you don’t like into a space that you LOVE. I was just bemoaning the fact that most houses are not built with mudrooms in our neck of the woods. I think it’s such a great and practical idea! The storage is awesome, and that stencil makes the room! So lovely! LOVE this project. 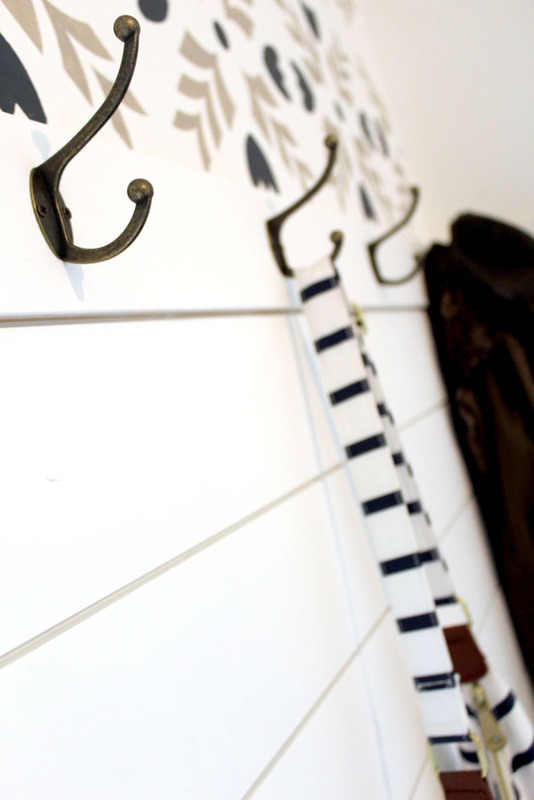 I have been pinning to my mudroom board like crazy. 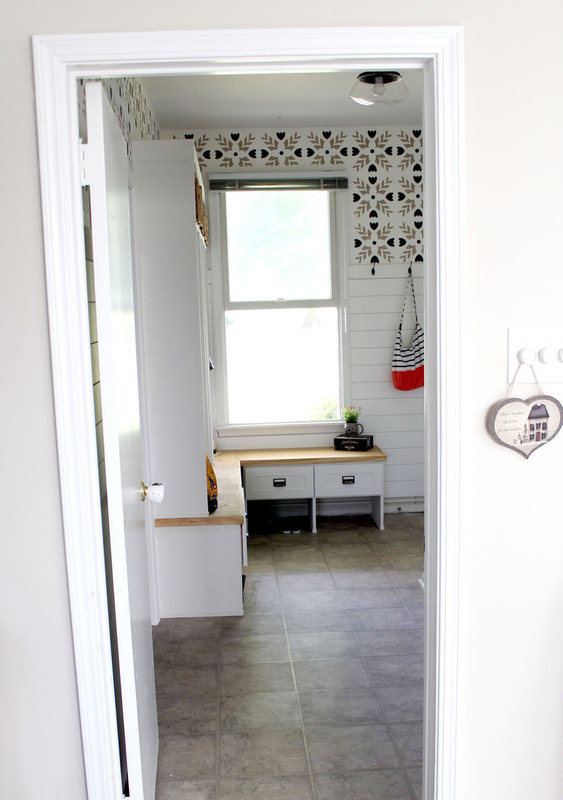 I am trying to figure out how to make a mudroom/laundry room. I wish I had the great space you have. Looks fantastic! Thanks so much Kippi! It actually looks like a lot of space, but it’s a very weird L-shape. (We had to use the ladder to get some of the shots). 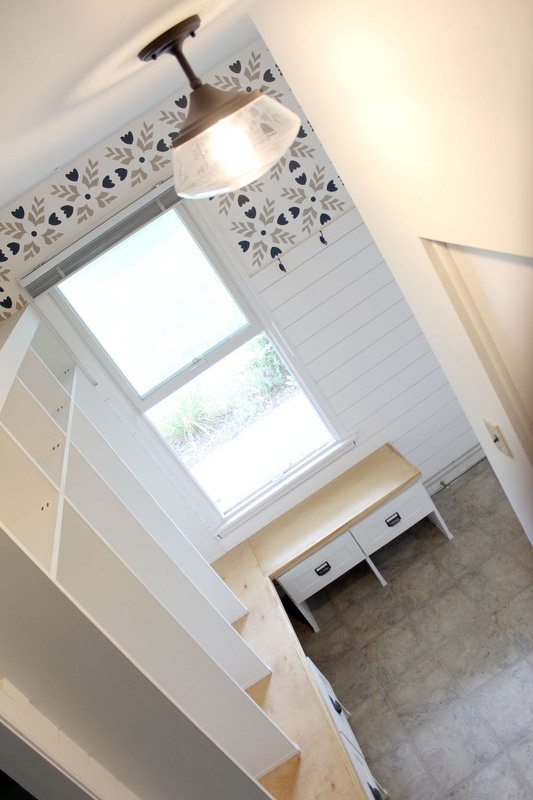 Even if you can create a little nook somewhere, you can use the wall space to your advantage. What about a stacking washer/dryer too? This looks great! This is the next project on my to-do list! It really is an amazing transformation! 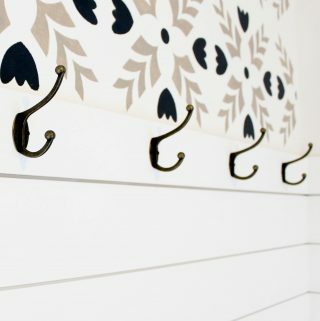 I absolutely love the shiplap, stenciling, and all of the hooks. Thanks for sharing with SYC. Thanks SO much Jann! Yes those are my favorite parts too 🙂 We are going to add little mail slots on the end too – with the same card catalog look. Great Job. I love all the storage space. That’s super cute! I love the low cupboards / seats. Really lovely use of space. Thanks for joining us for the #dreamteam linky.